Villa de luxe à une courte promenade du village pittoresque et traditionnel de Pissouri avec ses nombreux bars et restaurants et à égale distance de Paphos et Limassol, un endroit idéal pour explorer l'île. Un des trois villas d'un étage conçues individuellement Il dispose de 3 chambres (2 doubles et 1 simple) 2 salles de bains (une en-suite), salon avec accès terrasse à la terrasse, salle à manger, une grande cuisine bien équipée et buanderie séparée. Magnifiquement meublé, moderne, mais chaleureuse, avec climatisation / chauffage; TV avec des chaînes anglaises incl. Films / dessins animés / Nouvelles etc, CD / DVD. Cette villa exclusive dans de beaux jardins avec vue panoramique sur la mer dispose de grandes terrasses pour manger en plein air / barbecues avec auvent rétractable pour l'ombre. Les terrasses et la piscine à l'extérieur peuvent être éclairés la nuit pour créer une bonne ambiance pour les repas du soir. La piscine privée de 8 x 4m a carrelée pelouse, chaises longues pour profiter du soleil. Un sanctuaire idéal pour se détendre. Salle de bains attenante à la chambre 1 avec douche, lavabo et wc. Grande salle de bain familiale / douche avec lavabo et wc. douche supplémentaire dans la zone à l'extérieur de la piscine. Baignoire bébé et pot fourni. Just back from another visit to Pissouri and missing it already. The spacious villa is very comfortable with a large open pool area and sea views. A large lounge with two sofas and TV showing UK channels was ideal if you wanted to stay in - we even caught a new episode of A Place in The Sun while we were there which featured Pissouri and a shot of the Villa! The large dining kitchen is well equipped with everything you could need if you like to cook. There are a number of very good restaurants in the village that are within walking distance and more down in the bay - a 5 minute drive. Have eaten in most of them over the years but O Vrakas in the village and Kastro in the bay are outstanding. The beach never seems crowded at any time of year with plenty of sunbeds and parasols at half the hire price you would pay in Spain. The beach is pebbly and kept very clean and a visit to the nearby beaches of Avdimou and Kurion are also worthwhile. Thank you Jan for a very relaxing and much needed break. So glad you enjoyed the villa, its facilities and pool/garden area and the village restaurants. It sounds like you have plenty to compare it with over the years. Your detailed and positive review is much appreciated and also helpful for future guests. I would love for you to stay again and hope to welcome you back sooner rather than later. We have just stayed in this lovely villa for two weeks (family of 4, 2 of them being teenagers). The villa was like home from home and provided us with everything we needed. We particularly enjoyed the pool and outside area which is very spacious with lots of different seating areas to enjoy. It is a really peaceful place to stay and we all came home feeling completely relaxed. The villa is about a 10 minute walk downhill to Pissouri Square where there are plenty of tavernas providing really nice meals. We really liked Michaels steakhouse which is only a 5 minute walk. We hired a car and got out and about in the surrounding areas which are truly beautiful. It was our first visit to Cyprus - we loved it all and having Jan's lovely villa to stay in made even more special. 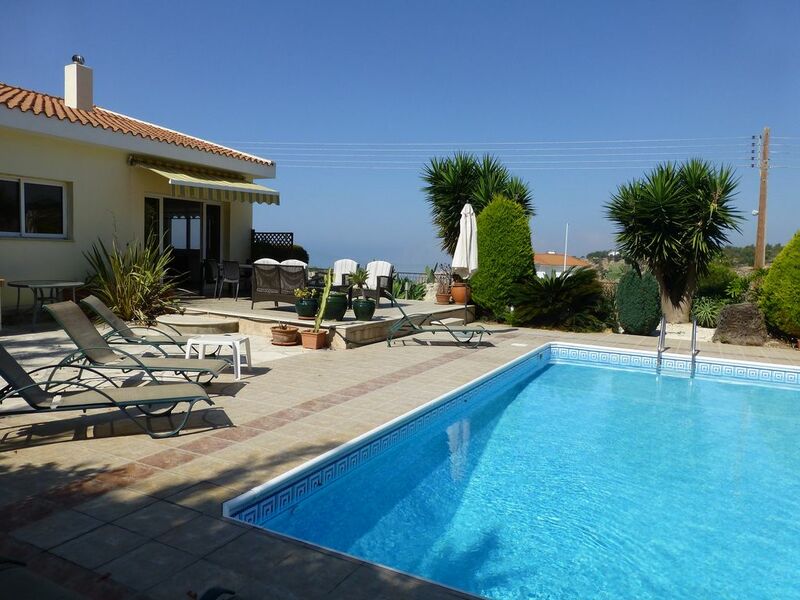 Excellent villa with fabulous gardens, everything provided including cot and baby towels etc. A fabulous villa in a lovely village. We've just returned from Jan's villa in the village of Pissouri. The instructions for arrival were very clear and a food welcome was waiting for us and was gratefully received. The villa was spacious and clean. There was English TV and free WiFi. Everything needed in the kitchen was provided. The outside area was my favourite part. There was a large sunny patio which a number of tables and sun loungers and a lovely pool which was very inviting in the sun! Many hours were spent eating and relaxing outside. The view was amazing too! We took our young daughter who made herself at home. The villa is on one level which she loved. Jan provided a cot, blankets, bath and potty for her. We had a wonderful week in this villa and are sad to be back at home. Thank you for a lovely week. We found the house great, plenty of sensible space inside and versatile space and seating outside. Great beds, good size and comfortable. Good facilities. There was a thoughtful welcome package left for us, it was a great standby until we were able to do the supermarket run on Sunday am. On Jan's recommendation Phil collected us from Larnaca Airport on the Saturday and also took us to Paphos Airport on the Sunday to collect our hire care, he was a reliable and helpful driver. The hot water wasn’t sufficient for 4 showers each morning so we had to use the immersion each day but with this boost it worked out fine. The house was so convenient for the village and the bay (a car is a must). We managed a trip into the Troodos mountains, lovely lunch in Omodos village. We ate in several of the restaurants in the village, Two Friends, Hide-Away, Bunch of Grapes which were all good and reasonably priced, our favourite was O Vrakas which we visited twice, it was that good, very friendly staff! In the bay we ate at Il Buchetto (good but a bit more expensive than anywhere else) and Kastro which was lovely. The Grape and Grain was good for a pre dinner G&T. Many thanks for your excellent review and so glad you enjoyed a lovely winter break. I look forward to welcoming you back next year. Best wishes Jan.
Had a lovely 1 week stay in Pissouri.Comfortable villa with great outside space and pool and everything you need for a home from home stay.Excellent customer service from Jan.We would definately return and recommend to friends. Pissouri is a fabulous place to stay for a quiet,relaxing holiday.Wonderful restaurants within a 10-15 min stroll from the villa. Thank you for taking time out for giving a great review. I would love to welcome you back perhaps for longer next time. La villa est à seulement quelques minutes de la plage de Pissouri. La plage Pavillon bleu est propre, a une pente graduelle, le rendant idéal pour les enfants et a de bons équipements. Jet ski, planche à voile, parapente, ski, plongée avec tuba et de plongée sont quelques-uns d'entre eux ou tout simplement profiter du soleil sur les transats à la location. Derrière la plage, un assortiment de boutiques et de restaurants pour répondre les visiteurs jour et de soir. Le long de la côte et à proximité sont plusieurs autres plages, encore une fois avec de bonnes installations. L'aéroport le plus proche est à Paphos 15-20 minutes en voiture. Les taxis sont disponibles, mais si vous voulez explorer Chypre location de voiture est également disponible localement et à l'aéroport et la conduite ne pouvait pas être plus facile, les routes sont excellentes et la conduite est la même que dans le Royaume-Uni. Pissouri est facile de se rendre à proximité de l'autoroute principale qui accède à la fois de Paphos et Limassol. L'aéroport de Larnaca se trouve à environ une heure de route. La villa est à dix minutes à pied / 15 min à pied de Pissouri Village Square. 8 min en voiture de la plage de Pissouri (drapeau bleu). 10/15 min de route du Golf (Aphrodite Hills ou Secret Valley). 25 min en voiture de la ville de Paphos. 25 min de route de Limassol Ville. 20 min en voiture de l'Aphrodite Water Park et Fasouri Watermania. Booking Notes: A 30% deposit is required to secure a booking and the balance will be due six weeks prior to arrival. Booking procedures can be sent via email, please ensure you have read them before booking. Please note: a £200 returnable security bond is also required and must be paid when making your final payment. This will be repaid within two weeks of your return home following a satisfactory inspection of the villa. Changeover Day: As holiday flights arrive daily the changeover day is flexible. On change over days, a period for cleaning/laundry services is needed. During quiet periods, depending on flight times, we will try to be flexible in arranging the arrival/departure time. Notes on prices: Prices are for the property per week in UK pounds. 30% non-refundable deposit is payable on booking, balance payable 6 weeks before arrival date. All payment are to be made by cheque or bank transfer and in Sterling £'s Minimum booking period is one week. Requests of less than one week will be accepted see charges. Please note: £200 returnable security bond is also required and must be paid when making your final payment.